Here is some advice – never constrain your MS Project tasks unless you have to! Unfortunately many people constrain their tasks inadvertently, by poor use of MS Project. Ideally you would want a “dynamic plan”, i.e. one that changes dynamically as tasks are completed. This determines the sequence of activities in the project, and if each task took 2 weeks, then the whole project would take 6 weeks. A dynamic plan means that if one of the tasks took a different amount of time, the plan updates. In this case Task B now takes just 1 week, and finishes earlier, allowing Task C to start earlier, and the complete project finishes in 5 weeks. Initially they enter the tasks, however, they then set the start dates of each task. ……and now if Task B completes in just one week, this static plan does not update Task C, and the project still takes 6 weeks. The clue that ‘Something is amiss’ is to be found in the ‘Indicators Column’. Setting the dates manually automatically adds a ‘Start No Earlier Than’ type constraint. 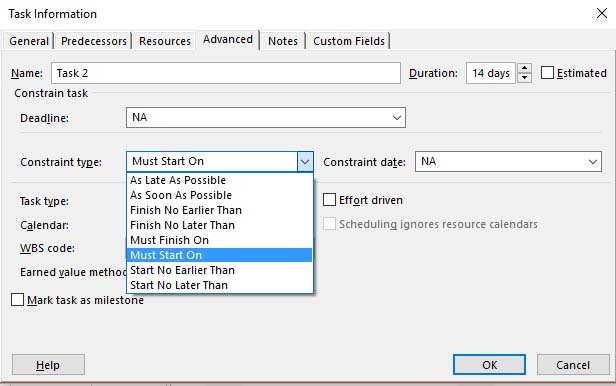 To edit the constraints for any task, double click the task to get the ‘Task Information’ Dialog, and then navigate to the ‘Advanced’ tab, and select the appropriate constraint (‘As Soon As Possible’ means when the task preceding is completed). This does, of course require all tasks to be linked by adding predecessors. 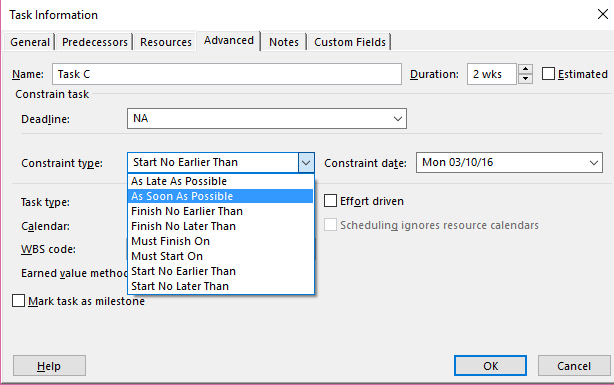 Some tasks “must” be constrained, as they happen on certain dates. Tasks such as deliveries, meetings, need to be constrained, but the use of constraints should be kept to a minimum. 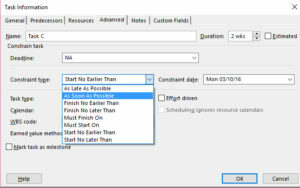 Setting ‘Start’ dates for tasks automatically adds a constraint that might not have been intended. A dynamic plan requires all tasks to be linked, and all tasks to be “As Soon As possible”.